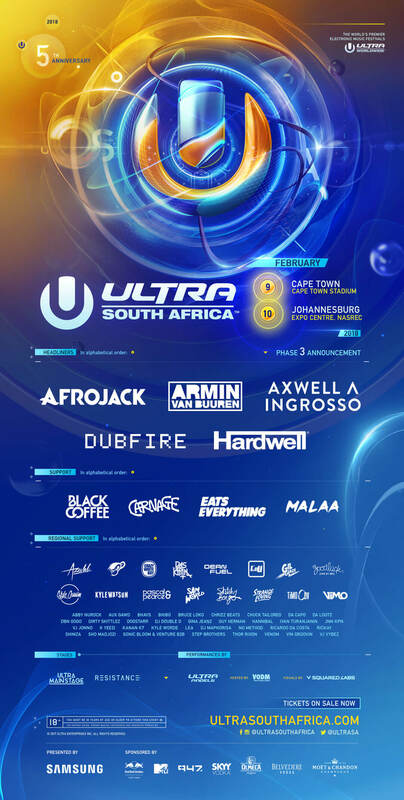 As ULTRA South Africa 2018 draws nearer, the festival’s lineup continues to grow even more impressive. Calling on a diverse selection of star-studded international talent and home grown heroes, next year’s fifth anniversary is set to be their biggest to date. Welcoming one of the world’s most renowned underground producers to the RESISTANCE stage, Eats Everything is the latest international addition to the billing and is set to join the likes of Black Coffee and Dubfire in the mix. Having played multiple RESISTANCE stages and events across the globe, the UK heavyweight is destined to treat the crowd to a serious dose of house and techno. Showcasing South Africa’s exceptional flair for electronic music, some of the country’s biggest and most respected artists have also been added to the final lineup. Timo ODV, Sketchy Bongo, Crazy White Boy, Good Luck, Fresh, Euphonik, Shimza, Da Capo, Kyle Watson and many more will all be bringing their own various blends of house music to the decks. To be a part of the momentous fifth anniversary event, presented by Samsung, head over to ultrasouthafrica.com for tickets. For table reservation inquiries, fill out this form here. To get a sense of what’s in store, watch the 2017 Aftermovie here.